On Monday, Brendan announced ALDLAND’s 2015 March Madness bracket challenge. This is our fourth year hosting an NCAA tournament contest, and our second in a row partnering with Baddeus Thaddeus Lenkiewicz. Important: there still is time for you to join. Click here to submit your picks for a chance to win limitless fame and one of the other “prizes” Brendan detailed in his post. As an added incentive, we are bolstering the first-place prize package with a Mike & Mike Fifteenth Anniversary t-shirt from the gift basket the Mikes sent us for being such good listeners and always finishing our dinners before getting up from the table. Shirt is one-size-fits-you because they only sent us one (a Golic-ish XL). Enter your picks here, and read about all the details here. 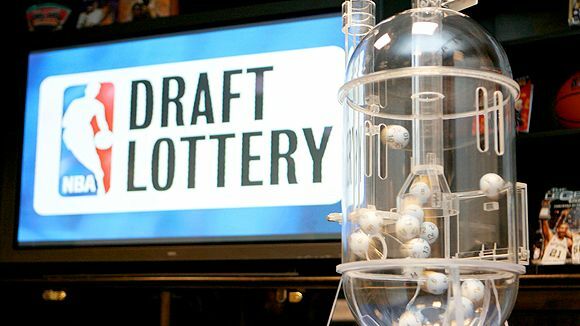 The NBA Draft Lottery is the ping-pong-ball-centered game the league plays with the four worst teams from the previous season to determine the order of selections for the next player draft. It’s basically beruit/beer pong with millions of dollars instead of Keystone Light, and, like timid lightweights, the winner doesn’t want to stay on the table for the next round. The positions are selected in descending order, and the number of balls a team has in the hopper is inversely proportioned to how well the team finished the prior season. The ostensible idea is to give the last-place team the best shot of getting the first overall pick (i.e., the best chance at improving its lot in the future). Why not just award the worst team the first pick as a rule? I suppose the idea is to avoid the sort of tanking that allegedly is a problem in the NFL, where such a rule is in effect. Injecting an element of chance means it’s harder to game the system in a way that’s detrimental to the game– losing on purpose– although it can’t fully do away with the incentive to lose so long as it maintains its rehabilitative goal. This year, the Charlotte Bobcats had the worst season in NBA history. The New Orleans Hornets, recently late of league ownership, merely had the fourth worst of the 2011-2012 season. This year’s draft lottery thus was arranged with the stated goal of giving the Bobcats the best shot at the first pick and the Hornets the worst. It might not seem like it, but, as discussed on ESPN Radio’s Mike & Mike this morning, LeBron James’ current season is the best season a professional player has ever had. John Hollinger, also of ESPN, created the Player Efficiency Rating (PER) metric for basketball players. In (his) general terms, “the PER sums up all a player’s positive accomplishments, subtracts the negative accomplishments, and returns a per-minute rating of a player’s performance.” It’s an advanced metric, and really, it’s a doubly advanced metric because it’s derivative of other advanced metrics. If you want it, the nitty gritty is here, but what PER allows us to do is compare individual players with their contemporaries and with those from other eras on equal footing. The full list from Basketball-Reference is here. James already has two of the ten best seasons, and he’s the only active player in that group. (His teammate, Dwayne Wade, is the next active player listed, at 13.) If the current season ended today, though, James would post a PER of 32.8, by far the highest mark ever recorded. Perception is a valid and important check on the things statistics tell us. I feel like there are a million things one could write about James and perception, expectations, image, and legacy, all of which would get at the fact that the title of this post is something I’d guess most people reject as an initial, gut reaction but also something we all expected we would read, write, or say at some point. There are myriad potential lessons here. One is that these advanced metrics are a way of witnessing history in the moment, something that’s difficult to do based upon perception alone. Another is that, darn it, I hate LeBron and sabermetrics are for idiot-nerds. A third raises questions about the value we place on winning championships as a component of individual players’ legacies. A fourth is that Patrick Ewing, whose best season comes in at #117 on the big list, might not be the Dan Marino of the 1980s and 1990s NBA, and Kobe Bryant, whose best season so far comes in at #51, isn’t quite the heir to His Airness’ throne, or even Shaq’s big seat. And on and on. After delaying the supplemental draft to hear ovations from disgraced former Ohio State University quarterback Terrelle Pryor, NFL Commissioner Roger Goodell decided, contrary to the apparent application of NFL rules, that Pryor would be allowed to enter that draft, and, contrary to ready explanation, that Pryor would be suspended for the first five games of the regular season. That Goodell would allow Pryor into the supplemental draft was not a surprise. Despite a likely inability to make the requisite showing of “changed circumstances,” Pryor was too (in)famous to be left out, and some teams had whispered an interest in him. The five-week suspension just so happens to exactly mirror the suspension Pryor would have faced had he returned to play at Ohio State, assuming he would face no further sanctioning. It’s unlikely that this is a coincidence, since it is a disproportionately heavy punishment when compared with other NFL game suspensions. The obvious and unanswered question about the conditions of Pryor’s eligibility is, “why?” Goodell’s reputation, as established early and often through his treatment of players like Pacman Jones and Michael Vick, is as a tough, paternalistic disciplinarian. Players who violate league policy or the law can expect to be punished by the NFL under Goodell’s watch. What was completely unexpected, however, was that Goodell would act to enforce violations of NCAA policy. Pryor has violated no laws, and no policies of the NFL. Why, then, is Goodell punishing him? The only answer can be that Goodell is punishing Pryor for violating NCAA policies, something that 1) is absolutely beyond his authority, and 2) sets an untenable and inappropriate standard as applied to events in the recent past and the potential near future. For example, what of Seattle Seahawks head coach Pete Carroll, who fled Los Angeles as his USC program went down in NCAA-sanction flames (to say nothing of Reggie Bush)? What if the new NCAA investigation of the University of Miami finds that current NFL players who played there violated NCAA rules? What if the NCAA’s ongoing investigation of Auburn turns up infractions by Cam Newton, the Carolina Panthers’ new starting quarterback? Does this new aspect of the Goodell Doctrine, the Pryor Precedent, mean that all NCAA rule breakers who go to the NFL now can expect to face punishment from the professional league as well? And why wasn’t Pryor himself entitled to notice of this new punishment policy? Finally, it is notable just how transparent a departure the suspension was from anything resembling the norm. After hearing the news of Pryor’s conditional eligibility at lunch yesterday and going to post a 140-character version of this post on Twitter, I found the feed full of links to similar reactions. Even for those on board with Goodell’s “new sheriff in town” approach before this week, I imagine this is a departure too attenuated to justify. What, after all, was Goodell’s motive here?